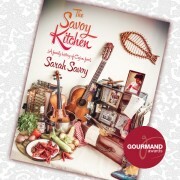 We were really excited to hear that Sarah Savoy’s The Savoy Kitchen – A Family History of Cajun Food is the UK winner of ‘Best US Cuisine Book’ at the Gourmand World Cookbook Awards 2013 – a fantastic Christmas present, and incredibly well deserved. The book will now go on to compete for ‘Best in the World’ at the Beijing Cookbook Fair in May but for now, best in the UK will do just fine. The Savoy Kitchen is the 3rd Kitchen Press title to get a Gourmand accolade so congrats and thanks also to the team that makes it all possible. http://www.kitchenpress.co.uk/wp-content/uploads/2014/01/Book3_Savoy_portfolio_award.jpg 600 600 Boss http://www.kitchenpress.co.uk/wp-content/uploads/2013/09/KP-web-header-2.png Boss2014-01-07 14:01:262014-01-29 18:54:28The Award-Winning Savoy Kitchen!